Mesothelioma remains an unusual cancer that a limited number of centers treat in high volumes across the globe. Industrialized countries are currently experiencing an epidemic of mesothelioma and the incidence is expected to continue to rise for the next decade at least. The outcome of mesothelioma is poor with an overall median survival ranging between 10 and 20 months. However, due to the rising incidence and poor outcome, the amount of research in the clinical setting and in the laboratory has rapidly expanded over the past 15 years. Hence, it is important that all physicians involved in the care of patients with mesothelioma be familiar with the important issues related to this disease to have a thorough understanding of the tumor biology, staging process, treatment options and the role of multidisciplinary approach. Currently, cisplatin combined with an anti-folate agent has been recognized as standard of care for non-surgical patients with advanced disease. In the next decade, however, it is very likely that we will see new standards coming forward. In this book, edited by Professor Mineo, many world renowned contributors in the field of mesothelioma present an update of their research and clinical experience, putting their findings in perspective. 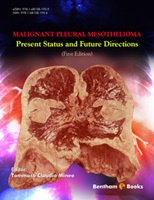 This book provides an excellent companion for physicians focusing on mesothelioma research and treatment as well as for individuals who may only see these patients infrequently. In 1974, I performed my first extrapleural pneumonectomy for mesothelioma on a 58 years old man. He was a heavy smoker with a history of exposure to asbestos. The local aggressiveness of the tumor was impressive and I was struck from the high demolitive nature of the operation. I took a Polaroid of the surgical specimen - which now appears at the end of this preface - as a sort of remembrance of that naive feeling. At that time, my expectancy was that future medical achievements would offered a chance of cure to patients with this malignancy. Over the years, I have been often renewing this question to myself: is there a way to combat mesothelioma effectively? Is this actually an invincible disease? Recently, I have done my last operation for mesothelioma. This time, the patient was a woman who had never smoked in her life. She also had never been in contact with any evident source of exposure to asbestos. While performing pleurectomy/decortication, I was considering that surgery has not substantially changed over decades. The main goal of surgery continues to be symptom palliation, as it fails to improve significantly the chance of long-term survival in many instances. Malignant pleural mesothelioma remains an extremely severe condition worldwide. Statistical figures are impressive. The overall incidence is expected to rise in the next future, a fact which also carries social and economical issues. The malignancy conceals so many biological secrets, but the first glimmers of light are already evident. This situation urgently calls for a multidisciplinary effort aimed at improving the extremely poor prognosis of these unlucky patients. So far, what has changed on malignant pleural mesothelioma management? In order to better reply this question, my idea was to involve all my colleagues and friends - each one having a highest level of expertise in this field ¬- in this Editorial project. All the most relevant innovations on pleural mesothelioma are put together in this E-book, which is structured in keeping with a multidisciplinary view of this disease. In this regard, I believe that the electronic format would have been the ideal one to improve the accessibility to the contents. We well know how much medical students and surgical residents of the new generation are familiar with mobile phones and laptops. A traditional paper book would have probably failed the mission of reaching out to our pupils. Finally, I would like to thank all the contributors of this book. All of them are re-nowned scientists devoted to specific settings of malignant pleural mesothelioma. The book would have not been possible without their cooperation and friendship. Their progresses are our hopes; according to these contributions we will be able to reduce an increasing number of patients from the high rate of mortalities still occurring as a result of this dreadful disease.